EEG (electroencephalography) is one of the most accessible techniques used to measure brain activity in humans. However, EEG measurements are affected by surrounding tissue and the spatiotemporal organization of the underlying neural activity that comprises the EEG signal is still hotly debated. Less debated is the neural activity that comprises the intracortical LFP (local field potential) measure. Our focus is to reconcile the spatiotemporal relationship between LFPs and EEG to better understand what neural activity supports EEG signals, using novel cross-species data and statistical analysis. We also develop unsupervised statistical learning methods for medical signal and image processing, and tools for data visualization and dimension reduction. Applications include artifact removal in electrophysiology data, feature extraction in microarray data, and identifying brain networks in functional magnetic resonance imaging (fMRI). Matteson, D.S. and Tsay, R.S. (2015), “Independent Component Analysis via Distance Covariance,” To Appear, Journal of the American Statistical Association. Risk, B., Matteson, D.S., Ruppert, D., Eloyan, A. and Cao, B. 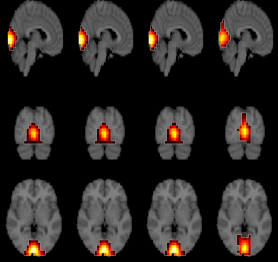 (2014), “An Evaluation of Independent Component Analyses with an Application to Resting State fMRI,” Biometrics, Vol. 70, No. 1: 224-236. Risk, B., James, N.A. and Matteson, D.S.